What a better way to complement the dishes being served than art! 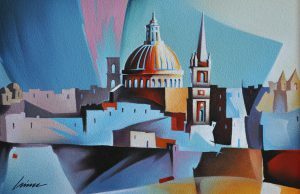 With pleasure, I announce that I am now the artist-in-residence of Oleander restaurant in Xaghra Square, Gozo. Together we hope to offer a culinary and artistic experience offering clientele the rare time of luxury to appreciate their surroundings, to take in the room, and focus on the walls while savouring the food. To me, art and food relate in many ways. To work in a kitchen and to work in a studio is to work backstage to present a pleasing final product. Self-identity, social life, health, economics and aesthetics could all be possible common points of interest. 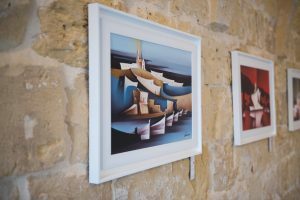 Inspired by my current residence on a Mediterranean island and its many colours, most paintings capture typical everyday scenes of an island life. 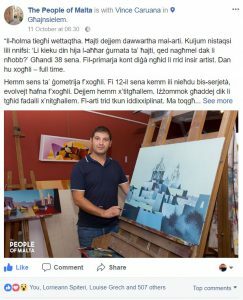 Thanks to The People of Malta for choosing to feature me as one of their guys! 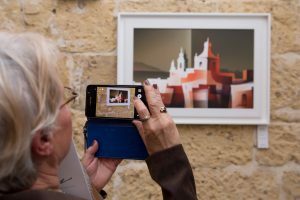 This week I took a stroll through Victoria’s ancient narrow streets, due south from Santa Savina Church, along Triq Santa Marja and into Triq Librerija where the oldest library in Gozo is tucked quietly away, and as the street widened out behind Pjazza Sant Wistin, I found what I was looking for – the art..e gallery, an intimate arched space which is currently presenting a series of vibrant new paintings by local artist Vince Caruana. 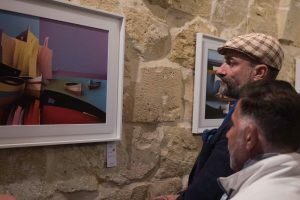 In this select exhibition Coordinates, each of the paintings depicts a real view of buildings and boats, hillocks or high ground – the coordinates with which each is labelled tell you exactly where to find each spot which The Significant Other and I thought was a cool touch. 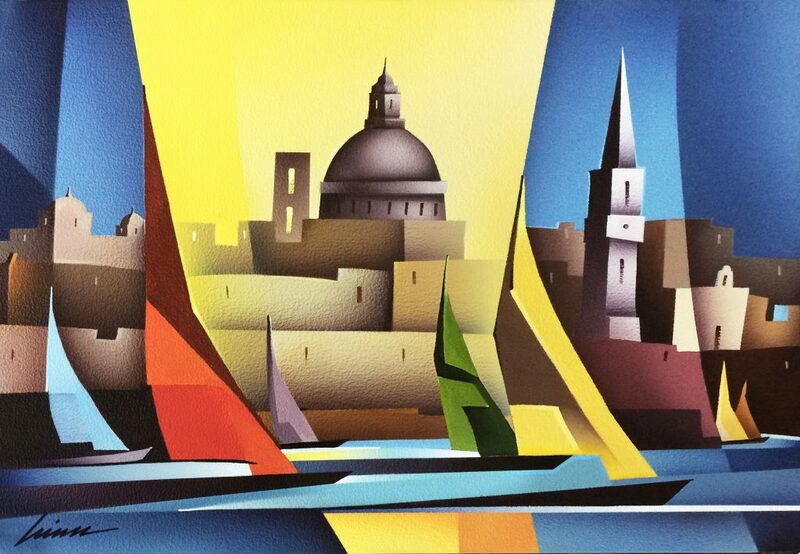 And whilst the photogenic fishing village of Marsaxlokk and the dome of Marsamxett, for example, have inspired hundreds of artists before him, with strong bold colours and sweeping curves, a geometric flavour and contemporary flair, Caruana adds his own spectacular twist to popular Maltese and Gozitan landscapes to make them his own. 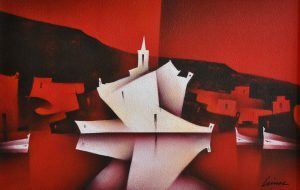 The pieces are suggestive of an other-world rich with passionate hues and wistful blues, and white light seems to burst from these paintings with an almost spiritual intensity: the viewer feels pulled right in as the layered cubist abstraction of each promises more – it’s as if there’s a whole story dancing before you for the taking beneath a broad sky. See the church of Marsalforn (36°04’17.6”N 14°15’37.0”E), a stunning white silhouetted against a surprising red and reflected in the bay below, and you’ll want to discover more about this building which, set slightly back from waterside, can pass unnoticed by the tourist hustle on the beach. I was captivated. Clearly the visitors who had come before me were equally taken with the paintings on these sandstone walls – every piece was already stickered to show it was sold. 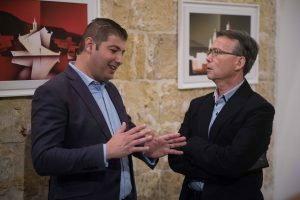 I am told however that Caruana has a studio in Ghajnsielem, two minutes walk from the village’s main square, which he occasionally opens to the public. I’m already looking forward to it. An art opening exhibition is always a momentous occasion for me. 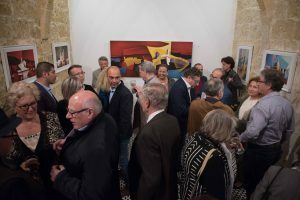 The art will never look as good as it does during its opening, the atmosphere is festive, the gallery is full, the cheese is tasty, the wine is crisp and everyone is merry! And to this I am grateful and thankful to many! 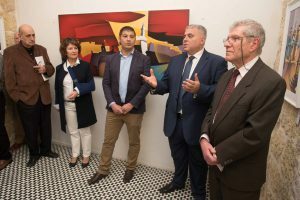 The Cassars – directors of Art e Gallery, the main sponsors – Joe Portelli of The Quaint and Silvio Rapa of The Grand Hotel, Alvin Scicluna of CVC, Attard & co., art critic Joe Camilleri and Dr. Anton Refalo – Minister for Gozo. 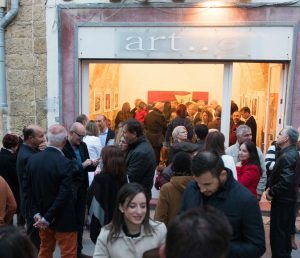 Last but not least, the numerous attendees and art lovers who made this a sell-out night! A collection of new works will open at the Art e…Gallery (Victoria) on Saturday the 8th of April at 19.00. Marking my sixth solo exhibition, Coordinates presents a selection of very recent contemporary landscape paintings. The name Coordinates, referring to a set of numbers used to indicate the exact location of a place, hints at the several Maltese & Gozitan places, I have visually interpreted in my geometric-abstraction style. 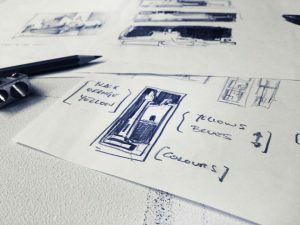 Welcome to the SketchBlog, the blog and newsroom for Vince Caruana, an artist by profession focused on making art work! I am particularly excited about launching this blog as it equally coincides with relaunching a revamped website and announcing my upcoming exhibition Coordinates, taking place in a fortnight. Stay tuned to the SketchBlog to keep up with my art!